While browsing the Halloween section of my local supermarket, I stumbled across this adorable pumpkin light for £2. Given the fact I had a £2 coin in my pocket and an itching for a Halloween hack project, it came home with me at once. You’ll see, if you look hard enough, the small orange LED within the plastic shell. Controlled by a switch beneath, the light was less than impressive once illuminated. And so the hack seed was planted. Now, I’ll admit to not having much coding knowledge. But what I lack in skills, I make up for in charm, and it didn’t take long for me to find help from a couple of Raspberry Pi staffers. Use a Raspberry Pi and Pimoroni Blinkt! to create an realistic lighting effect for your Halloween Pumpkin. Learn how at www. Take your Blinkt! and attach it to your Pi. If you’re using a 1-3 model, this will be easy enough, but make sure the Pi fits in your pumpkin! If, like me, you need to go smaller, you’ll have to solder your header pins to a Zero before attaching the HAT. You might want to make sure Raspbian is running on the newest version. Why? Well, why not? You don’t have to upgrade to PIXEL, but you totally should as it’s very pretty. Its creator, Simon Long, was my soldering master for this project. His skills are second to none. To upgrade to Pixel, follow the steps here. At this point, you’re more than welcome to go your own way with the Blinkt! and design your own light show (this may help). However, and with major thanks to Jonic Linley, we’ve created a pumpkin fire effect for you. To add more of a spread to the light effect, I created a diffuser to cover the Blinkt! LEDs. In the video above, you’ll see I used a tissue. I wouldn’t suggest this for prolonged use, due to the unit getting a little warm; I won’t be responsible for any subsequent tissue fires. I would suggest using a semi-opaque bowl (the ones you get a Christmas pudding in) or a piece of plastic from a drinks bottle, and go to town on it with some fine sandpaper. We also drilled a small hole in the back for the micro-USB lead to reach the Zero. I used a battery pack for power, but you could use a lead directly into the mains. 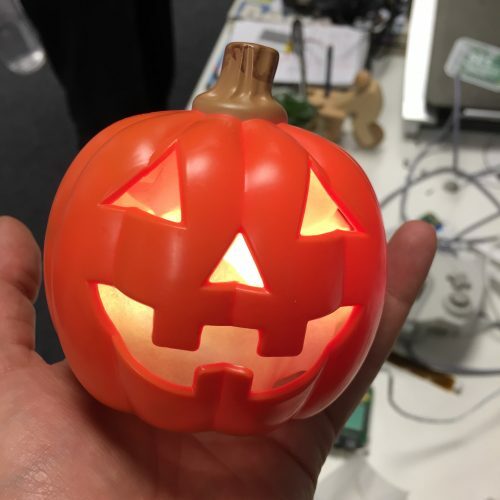 With a larger pumpkin, you could put a battery pack inside with the Pi. If you use this code, please share a photo with us below, or across social media. We’d love to see what you get up to. And if you want to buy the Blinkt!, the team at Pimoroni have kindly agreed to extend the cut-off for postage on Friday from midday to 3pm, allowing you the chance to get the unit through your door on Monday (so long as you live in the UK). You can also purchase the Blinkt! from Adafruit if you live across the pond. A very big pond, it seems!! It’s an age thing. I’ve been calling the Atlantic Ocean “The Pond” for thirty years and more. It was a thing that was common when I worked for IBM and corresponded with my international colleagues. In IBM we even labelled the two sides as Leftpondia (aka America) and Rightpondia (aka UK/Europe), I don’t know how common that is or whether it was just an IBM thing. The best name was for Perth, Western Australia which was known by some folks as “Outer Pomgolia” because so many Brits (aka Poms) had migrated there. BTW, well done Alex on you £2 purchase and re-purposing a Blinkt and publishing your code on Github. Another “pond”: here in New Zealand, we term the Tasman Sea The Pond, Aussie the West Island. Halloween is not (yet at least) as big an event, we go more for Guy Fawkes (to the consternation of dog/cat/horse owners). I suppose that’s the Brit/Colonial part of our history. 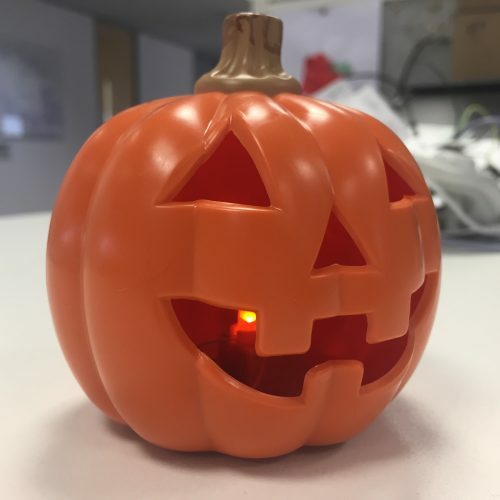 I did this as well (although the pumpkin decoration we found on this side of the pond cost $3 and had a lonely white LED in it, instead of orange). One difference in my project was that I used Pimoroni’s Unicorn pHAT, rather than Blinkt!. This makes the finished project brighter and able to use more complex patterns at a tradeoff of about 3x the cost of the Blinkt!. One other improvement to this project: Run raspi-config to turn off the X server – it’s not needed, and will only slow down the boot process (especially on the single-core Zero!). You can run the python script out of /etc/rc.local instead to have it start on boot. I haven’t put my code up on github yet (I will, I promise! ), but I’m using a script which has a number of patterns defined as functions (including a flickering candle pattern, which is a slightly slowed-down version of Pimoroni’s ‘random_blinky’ Unicorn example script), and uses signals from an external script (called via cron) to choose a random pattern to display on the Unicorn. I haven’t looked to see how compatible the Blinkt! is with the Unicorn, so ymmv. If you no longer want it to boot up on the display just remove the bottom line. I have never run a Pi headless, how do you switch it off ‘safely’?